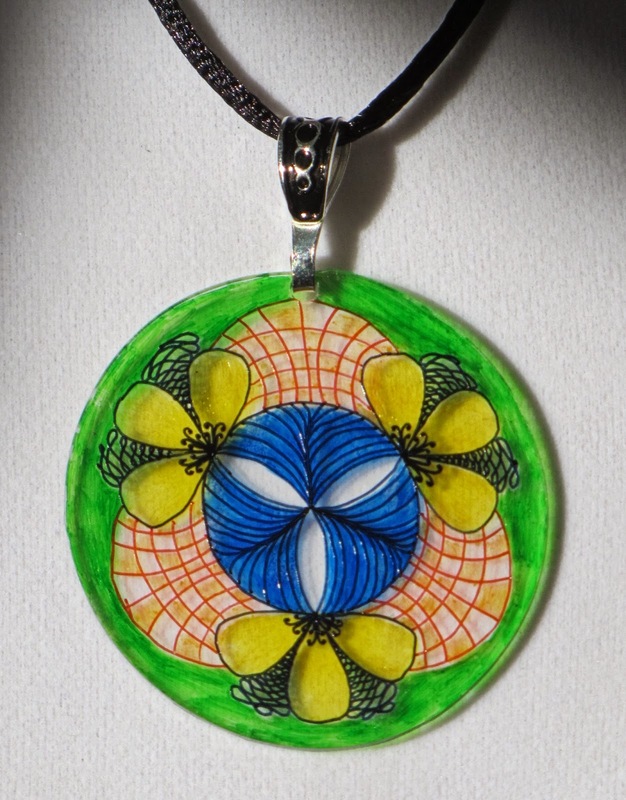 Tinker Tangles: Zentangle + Shrinky Dinks = FUN! 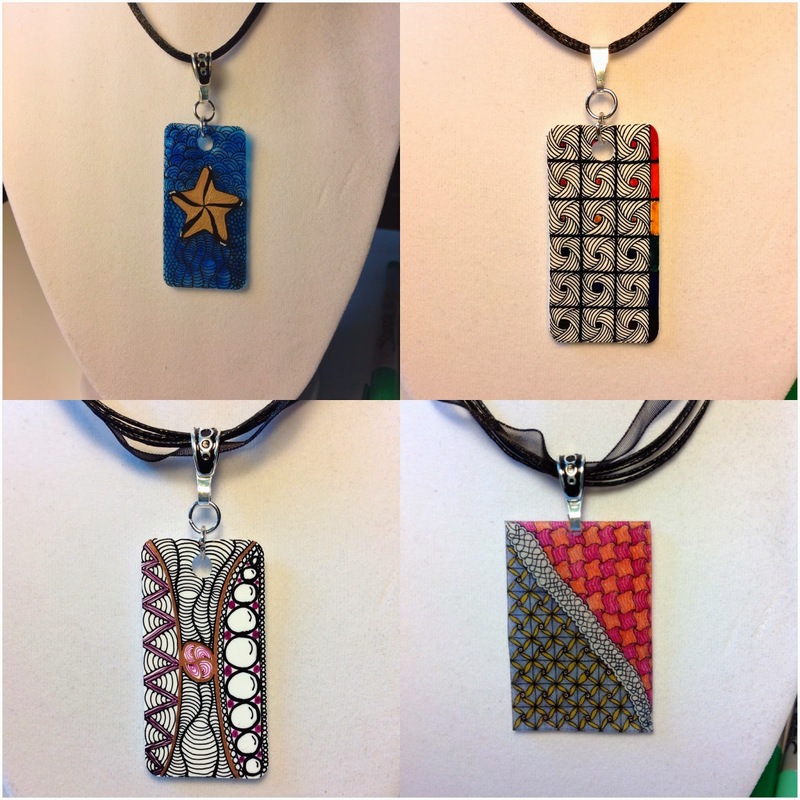 Zentangle + Shrinky Dinks = FUN! 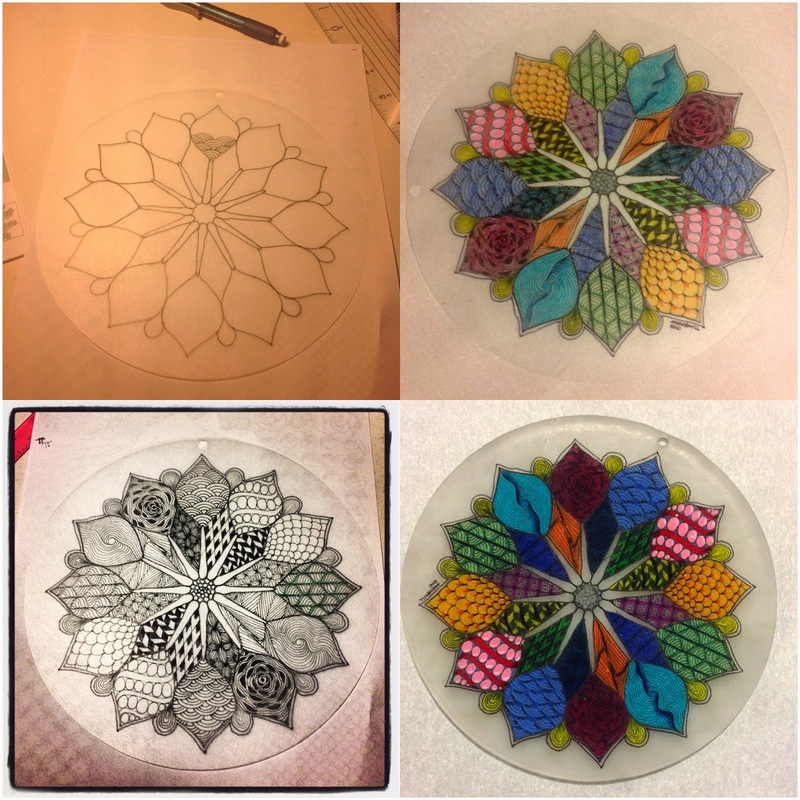 About this time last year, I got the idea to tangle some Shrinky Dink film and see what would happen. 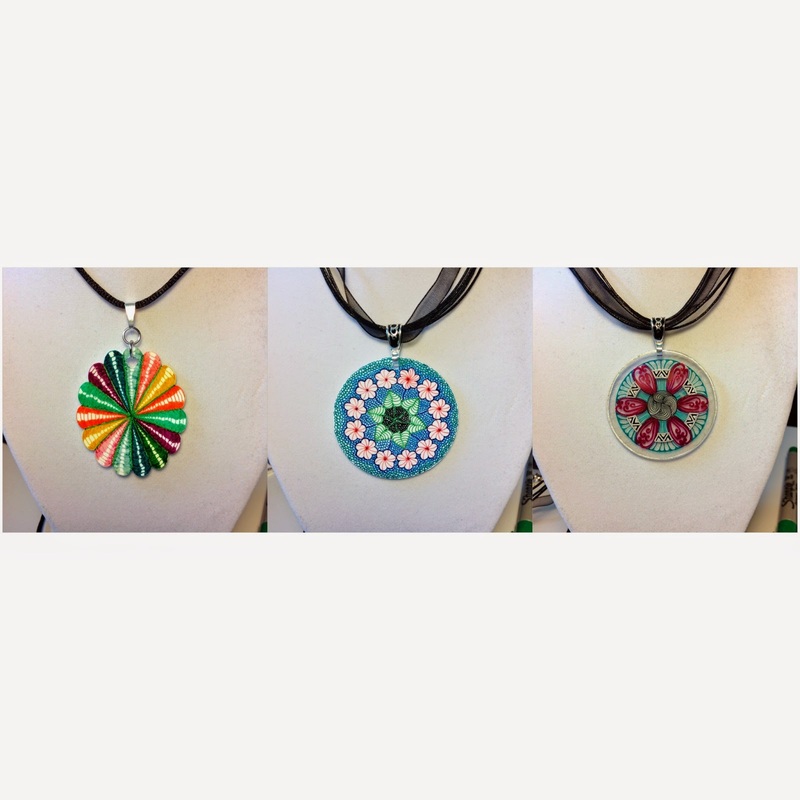 I thought that it would be fun to make some medallions to string on necklaces. When I am at Art and Craft shows, I find that pre-teen and teen girls are often very interested in my drawings but don't have the cash to invest in the pieces that they like best. There are note cards and prints available at the table but honestly, note cards are a thing of the past for these girls. Prints, well they will need frames. The idea of the necklaces I hoped would be a good idea, the price point isn't too much ($12 at shows and $14 on etsy) and if I do say so myself, they are fun. It turns out, that a lot of people like the necklaces notjust the younger girls. Each is an original piece of art, all are different, and even if I reused a template, it is unlikely that I would make it again in the same way. One zendala medallion even inspired me to turn it into a larger zendala on paper. Any of you that also follow me on instagram (TinkerTangles) will often see these pieces as they progress. One of my followers there asked if I had a tutorial on how I created the necklaces. I have been thinking that I should do a post about them and the request has led me here today. So, I will do my best for you that are interested. Hopefully this will be helpful. Please let me know if I am not clear of didn't answer a question that you may have. 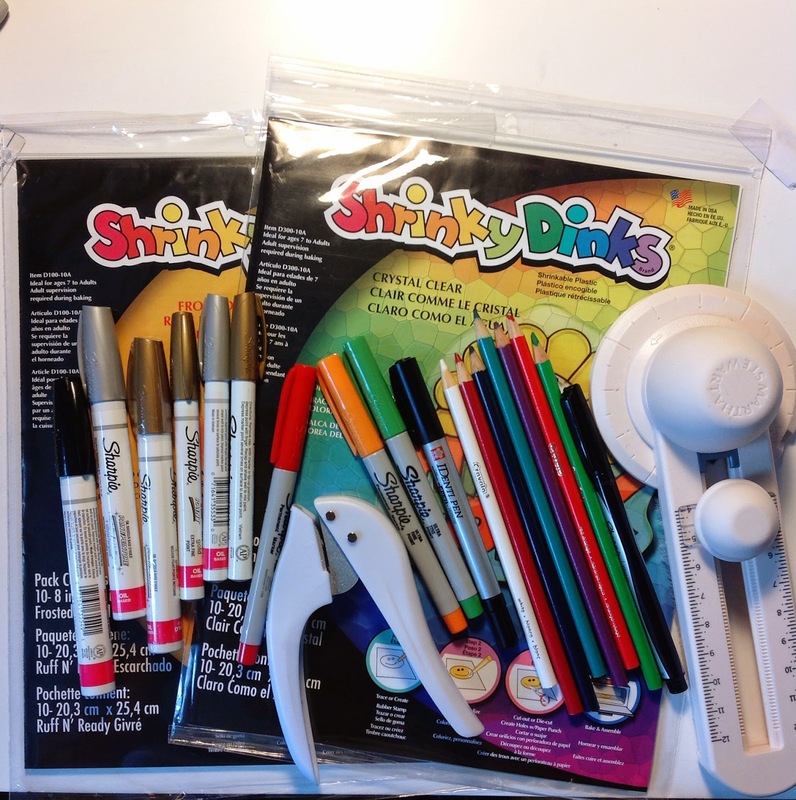 Many of you may remember Shrinky Dinks. I LOVED playing with them as a kid. Usually they came in packages with pre-printed designs that you then colored in with markers or colored pencils. Those can still be found online and probably in some stores. I use just blank sheets to create by medallions. You can also find all of their products on their website. There are a lot of choices there. I may have to do a little online shopping as I only have 3 kinds. I buy mine at Michaels. There are 10 sheets in a pack and I get at least 4 medallions out of each sheet. If you search shrink film on Amazon, you will find that there is another kind, I forget the name, but I have chosen to stay with a product I know. Speaking of products that I know, let me tell you what I use when drawing these. 1. Shrink film. I use Shrinky Dinks Crystal Clear, Frosted Ruff N' Ready, and Bright White. 2. Pens/Markers: I mostly use Sharpie MARKERS. The Sharpie pens will work on the Ruff N' Ready as the back is really rough and can eat the tip of your marker. The pens seem to hold up to that texture pretty well and doesn't bleed. I also use the Sakura Identi Pens. They really work well and the double tip is nice so that different line widths can be made. The drawback though is that the colors are limited to primary colors and black. I like the color choices that Sharpy has. I have also used the Bic Mark-It but I am afraid that they fade over time. So far I haven't had any reported issues, but I had one medallion that sat in the sun for a while and the darker colors faded. Probably because of the fact that it sat in the sun, but I don't want to take any chances. 3. Paint Pens: I use Oil paint pens. Water based ones don't want to work as well. I have used Sharpie brand, the Sakura Metallic pens and Deco Color pens. For all of them I use the extra fine or ultra fine point. I do have a few larger ones though. I use those when I want to fill in a large area or cover the back in one color. 4. Cutting Tools: I am lucky in that I have a Sizzix eclips that I have started to use to cut my film. It is so much easier. The machine is so great and cuts like a dream on the shrink film. HOWEVER, you do not need to buy an expensive machine. (A friend split the cost with me or I wouldn't have one.) Before the machine I got a circle cutter. Martha Stewart makes a nice one and you can adjust the size to what you want your circle to be. Scissors can be helpful to trim edges or to cut squares and or cut around any particular shapes you are making. Hole punch is also good to have around. 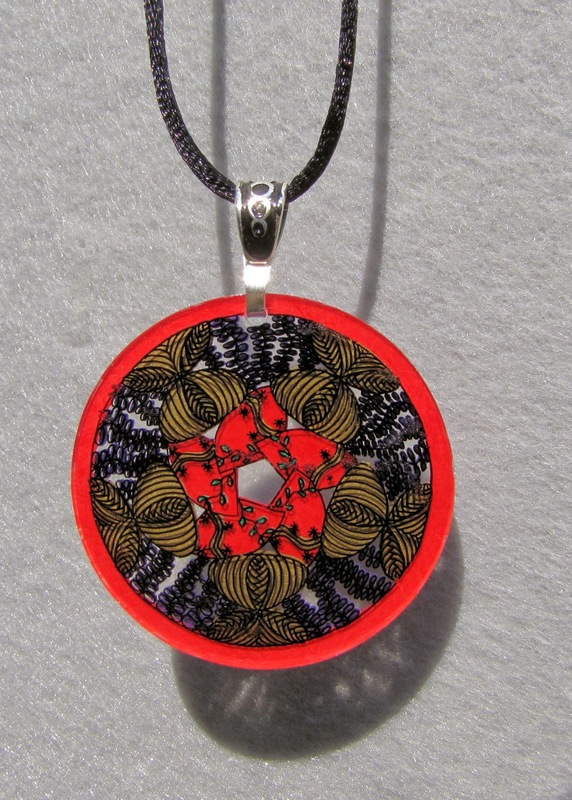 If you decide to create a medallion, you'll need a hole to attach it to the jewelry finishings. The size of a regular hole punch is a perfect size. 5. Jewelry Finishings: What you will need to make your necklaces, pins or earrings. 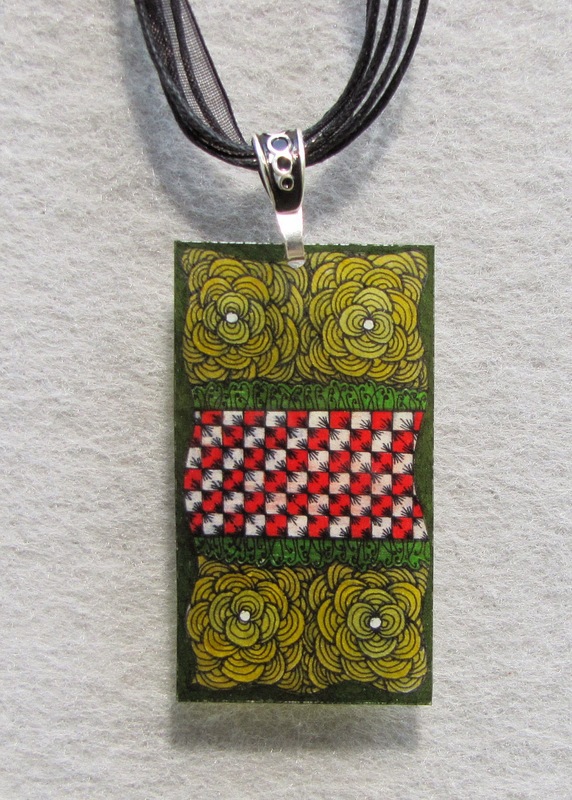 I use very simple satin cord as a necklace and add a bail to the medallion to attach it. 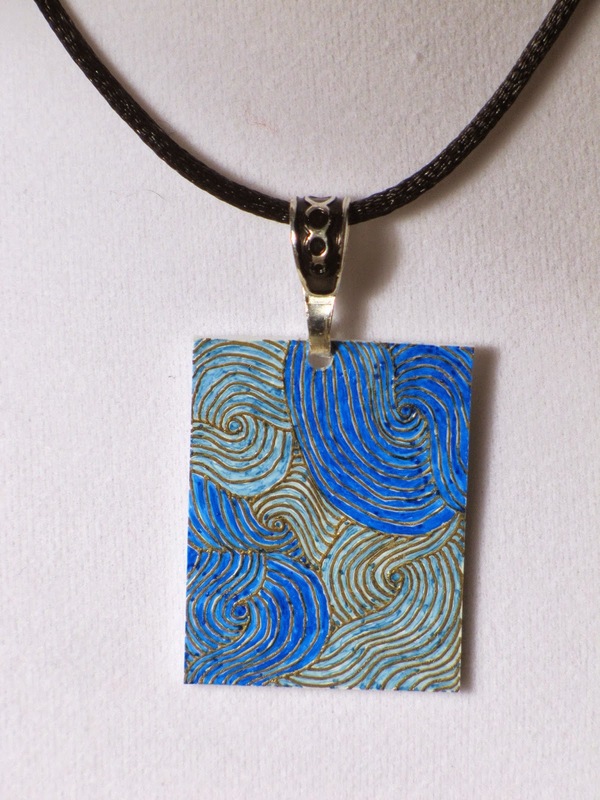 There are some shrink art crafters out there that make some INCREDIBLE pieces of jewelry. While their work is very inspiring, I am keeping mine simple. If you already make jewelry, you might have all the stuff to make some impressive pieces. My first medallion. The outline, the tangles, adding color and the final product. Now for the nitty gritty, making your design. I first cut out my shape. It is easier to start that way to me. For the pieces that I am currently making, I keep the film to 4.5". My circles are 4.5" in diameter. Squares or other shapes can vary but I make a point to have my largest size 4.5". Remember that your film is going to shrink down, so keep in mind what size you want your final piece to be when you cut your film. A 4.5" circle shrinks down to about 1 3/4". Some of you may be more math minded and can figure out the shrink down percentage. I am not however, and just tried different sizes until I had what I wanted. When it comes time to bake your film, I follow the directions that come in the package. They say a toaster oven is ideal but I use my regular oven and have great results. There are some that use a heat gun but I think that an oven is best. In an oven, the heat is even and since they need to be in the oven for 3 minutes, easier on your hand. A heat gun works great though if you have a problem area after shrinking and want to smooth an area out. I bake my film on parchment paper. The directions call for using a paper bag but I don't like the texture of the paper bags. If you watch your film shrink is is both very cool and a bit scary. When the film starts to shrink, it is going to flop about, curl around and has even been known to flip over! Don't fret however and DO NOT yank it out of the oven. Let your film stay in the oven the full 3 minutes. It will correct itself and lay flat. Only once or twice have a had a piece fold over on to itself and stay that way. That has happened when I was trying to make a really small piece. Sometimes, my circles come out a bit wonky, I'm not sure why though. By wonky I mean that it isn't quite round anymore. More of an elongated circle. Once your three minutes are up, you can take your piece out of the oven. THEY WILL COOL QUICKLY! I take mine out of the oven, lift the parchment and medallion off the cookie tray, and set the on the counter. I place a smaller piece of parchment on the top of the film, and use a small book to press lightly down on the film. (Don't use anything with a texture on it unless you want this texture pressed into the hot plastic.) This will help make sure the piece is flat. That doesn't mean that even then the piece is totally flat but usually it is. I have now decided what an acceptable level of wonky is. You can also return the pieces to the oven, it will not shrink more, but it will make the plastic pliable again so if needed, you can press them flat again. The photo above is the first medallion that I made. It is on the Ruff N' Ready film. First I trace/draw the outline or string. Then I add my tangles and color. Ruff N' Ready film. This film needs to have all of the rough parts colored in. You don't have to, but I don't care for the way it looks uncolored. Cheap colored pencils work great for this film. I use Crayola pencils. You can layer your colors with this. Just remember to do it in reverse. The shiny side is the side you are supposed to look at. Put down your color and add darker colors on top to create shading. Highlights are going to go down first. After these are done, I go back and add a layer of acrylic clear glaze over the rough parts. It seals the colors so that they don't get rubbed off. Crystal Clear Film: You can draw on both sides of this film. Create your design on one side and flip it over to paint sections to add color. When you do it this way, the design on the front casts a shadow onto the color and gives it more depth. You can also use a marker to add color in your design like a coloring book. Lighter color markers give the finished piece a light catcher look. Bright White Film: This film will take the Sharpie markers and the Oil markers really well. Sometimes after shrinking, the oil paint seems to sit differently on the film giving it a bit of an embossed look. Markers are smooth. If you want to be more traditional in bringing Zentangle to this medium, all you need is this and a black marker. Pens: I have not been able to get micron pens to work on the plastic film. I find that it wipes right off. The same thing happens with the Sharpie Pens when drawing on the smooth film. Sharpies don't. The color can "puddle" at the end of a line though so you'll want to keep that in mind. The puddles can help to add "shade" where you'd like it. There are gray pens that you can use for shading but I haven't had much luck there. For me, the lighter the color the better. Colors will become darker and more intense when after shrinking so keep that in mind when choosing your color pallets. Wow, these are SO Cool! What a grand idea. You did a very nice job explaining your technique. Just want I need, another project! Thank you for sharing and inspiring. Thank you! Fair warning, these can be addictive! Very cool pendants. 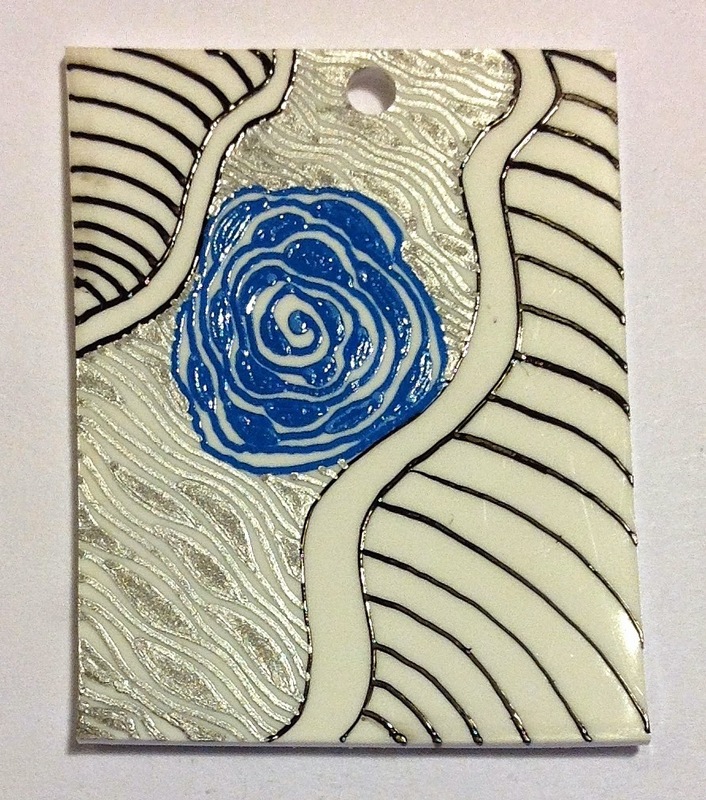 I have played with the rough n ready with zentangle and made some cool fridge magnets. Thanks for the tips on working with the others.